(Bloomberg Opinion) -- And just like that, it’s over. Rest in peace, corporate governance. 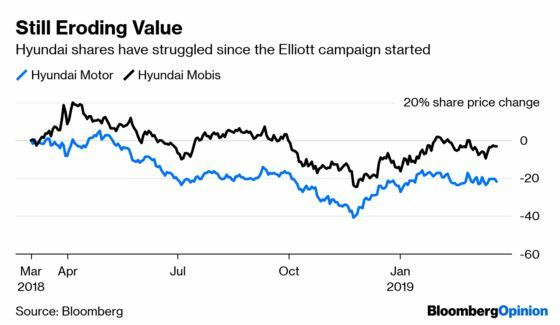 One of South Korea’s largest conglomerates, the Hyundai Group, has swatted away a large investor, Paul Singer’s Elliott Management Corp. Shareholders voted down proposals for change at Hyundai Motor Co. and Hyundai Mobis Co. at much-awaited annual general meetings on Friday. The worst part is stakeholders’ sheer apathy. They agreed that the group’s balance sheets are overcapitalized and the corporate structure is too complex. In its letter, Elliott noted that shareholders had formed a consensus. Why, then, couldn’t they vote for change? Sure, the asks were big. Expecting the companies to give in straight away, or even see eye-to-eye, would have been optimistic. But it wasn’t all about urging billions of dollars of dividend payouts or overhauling the board. Small changes could have been a start. Take the board nominees. As I wrote Wednesday, voting in Margaret Billson – a known name in industrial manufacturing – not only would have added expertise in the U.S. but also desperately needed board diversity. Voting in favor of experienced board members, rather than ones with questionable legacies at other companies, would have been another step in the right direction. For Hyundai, more clarity would go a long way. So far, the group has largely ignored shareholders’ demands without precise rebuttals. Offering a game plan with clear timing and details of why its own proposals are better would also signal shareholders are getting the respect they deserve. Even direct engagement would help. After all, the heir to the throne committed to doing this. Instead, the group has focused on bold (and still vague) spending plans to justify why it needs liquidity, without doing much for shareholder returns. A proposal to restructure the whole conglomerate is still in the works, and will be voted on at some point. In theory, that gives family heir-in-waiting Euisun Chung yet another chance to be more forthcoming with a path forward. To be fair, Hyundai has said it will engage more with shareholders – through an existing corporate-governance and communications committee – and plans to have an appointed director as the go-between. But in reality, hoping for more may end in disappointment as the company’s ambitions remain detached from reality. Investors in Korea Inc. are looking for companies with real corporate-governance change: The country’s largest domestic money manager, the National Pension Service, voluntarily signed up to a stewardship code last year. Unfortunately, the search will have to go on.